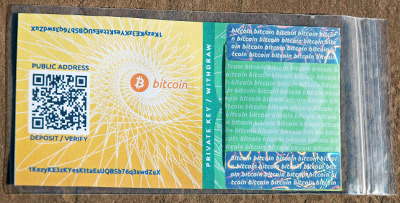 A paper wallet is a way of storing bitcoins outside of the digital world (i.e. computers) as a physical piece of paper. You can secure a paper wallet like cash or anything else of real-world value (e.g. keeping it in a safety deposit box). If you follow good security practices, paper wallets are one of the safest ways to store your Bitcoins. How is a Paper Wallet created? Paper wallets are created by printing a new Bitcoin Wallet (i.e. public address) and private key onto a piece of paper. Bitcoins are then transferred from another "live" wallet to the paper wallet's public address for safekeeping. Are Paper Wallets different from regular Bitcoin Wallets? Yes. While regular Bitcoin wallets allow you to transfer (withdraw) a portion of a your bitcoin balance (e.g. to buy goods at a store), a paper wallet only allows you to withdraw the entire balance. When you want to withdraw from a paper wallet, you import the full balance to a new wallet address. Once the transaction is complete, the paper wallet should be discarded and not used again. Not for day-to-day use. Only allows you to withdraw the entire balance. Care must be taken to securely generate paper wallets since an attacker can steal the present and future balance of a paper wallet if the private key is exposed, transmitted, or generated with insufficient entropy (randomness). For recommendations on producing safe paper wallets, please go here.